Being a central highlight of Delhi, Lotus Temple is one of those religious attractions that bring all the religions together as its chief philosophy accepts every religion with an open heart. This monument was accomplished in 1986 and is a foremost site to visit in Delhi. It is built in the shape of a lotus and is stunning in its architecture and structural design which can blow anyone’s mind! Keep water bottles and snacks if you are going for a whole day but you can also check out the nearby restaurants and street foods that are a must to try here. Meditate in the serenity of this peaceful temple. Explore the quaint gardens situated in the temple. Savor the streets foods at the outlets nearby. 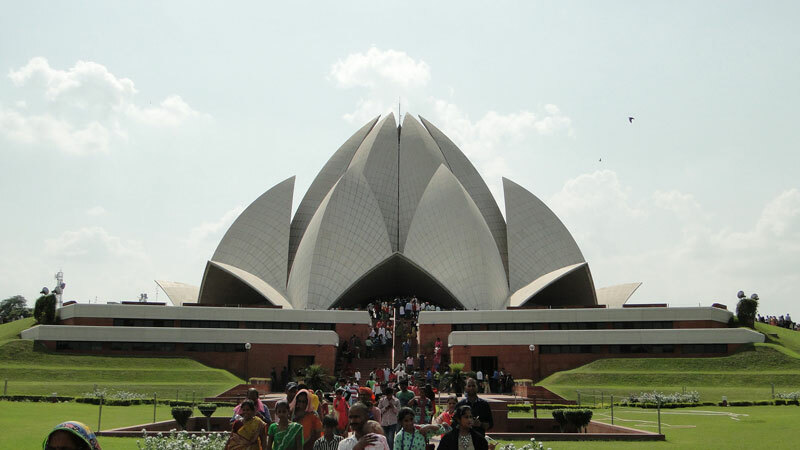 Guides are available for touring Lotus Temple in both Hindi and English. Lotus Temple is an ideal one to visit during the winter and spring time of October to March as the scorching heat of summers is not idyllic for travelling in Delhi. The closest metro station to Lotus Temple is Kalkaji Mandir Metro Station via violet line route. Moreover, it is finely linked through public transportation and road networks so you can either take buses or cabs to reach this place. This place is originally a Bahá’í House of Worship built for all kinds of faiths and religions. The architecture is more of an expressionist one with its flower-like figure which is designed by Persian draftsman Fariborz Sahba hailing from Canada and what’s most interesting about the shape of lotus inspired by which the temple is built, it is said that lotus is an emblem of love, purity and immortality. Being one of the most visited attractions of India, it has been recorded that this place has daily 10,000 visitors and almost four millions of tourists have visited Lotus Temple. Almost 10,000 diverse sizes of white marbles have been used to create this striking architecture. The Bahai religion to which this temple is associated with, do not has any idols, statues or pictures to worship. 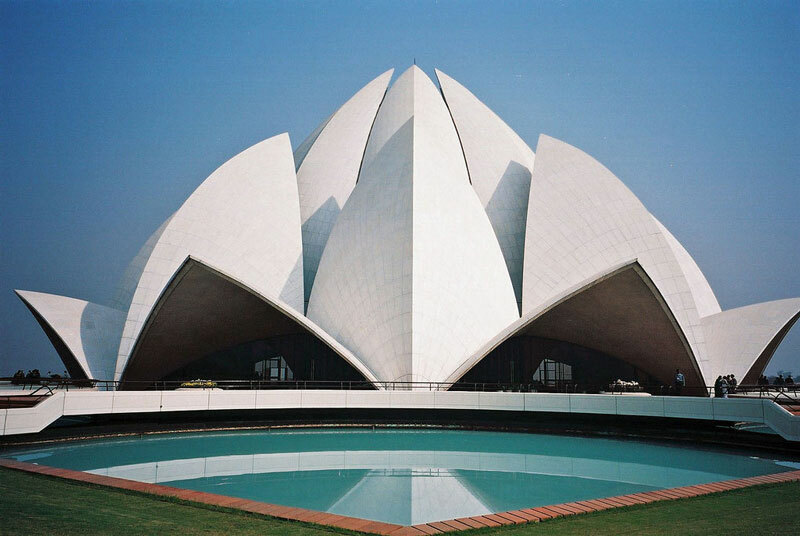 Lotus Temple is also called a Bahai House of Worship is the only one located in Delhi, India while the other six of total seven Bahai Houses of Worship are situates in different parts of the world i.e. in Sidney, Australia; Panama City, Panama; Apia, Western Samoa; Kampala, Uganda; Frankfurt, Germany and Wilmett, USA. Entering this place is much like stepping into a serene paradise where all faiths and religions have their place, where prayers are sent to God without discriminating them on the basis of religions and travelling all around the exquisitely charming gardens you will find yourself enveloped by a divine aura of peace. Lotus is also a sign common to diverse religions like Hinduism, Buddhism, Jainism and Islam. Lotus Temple is created of white marble and there are nine water pools all around the petal structure and these pools are accentuated with lights making it a mesmerizing wonder to spellbind anyone! Hence, a wonderfully created attraction and the incredible acceptance of all religions and faiths here at Lotus Temple make it a unique one to visit! So, if you are touring Delhi, make sure that you spare a day or even a few hours to come experience peace and tranquility here away from the bustling and teeming streets of the Indian capital city. It is a treat to one’s mind and soul and is an amazing place to do introspection and immerse oneself in the soulful aura of united faiths here! Happy journey!